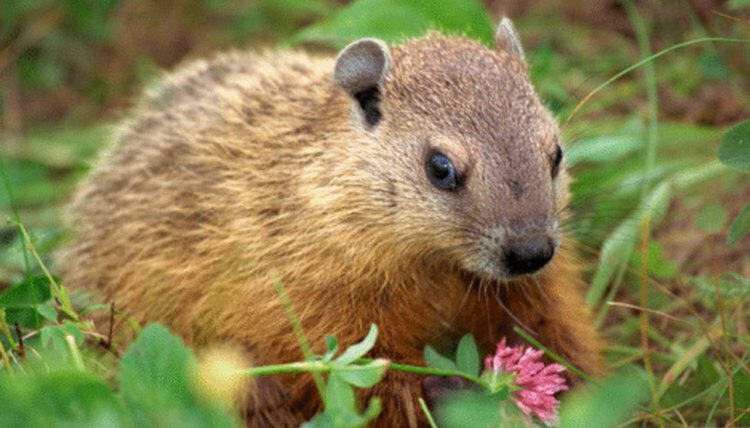 Groundhogs, also called woodchucks, are well-known for their holiday and ability to predict the coming of spring. They are proficient at raising their young, so you will rarely see abandoned babies; however parental death or severe rainstorms will sometimes create orphans that need care. These brown, furry rodents may seem cute and cuddly, but they do not make good pets and will need to be released to the wild when they are capable of fending for themselves. Additionally, most states have laws prohibiting keeping groundhogs as pets. Avoid picking up the groundhog with bare hands. Use gardening gloves to gently pick up the groundhog. Pet Care Tips, an animal advice website, advises you to immediately wrap the woodchuck in towels or blankets to keep it warm. Heat an infant electrolyte solution to body temperature over the stove or in the microwave. Fill an oral syringe with the electrolyte solution and offer to the groundhog every couple of hours. Fill the oral syringe with puppy milk replacer. To feed the groundhog, hold it firmly in a towel or blanket, covering its eyes. Offer the syringe and the groundhog will quickly drink the contents. Stop feeding if air bubbles develop in the syringe, and expel the air. Use a damp cloth to wipe its face. Repeat feeding every two hours. Stimulate the groundhog’s bowels and bladder with a wet cotton ball after every feeding. Keep stroking the genital area until the groundhog is done urinating. A groundhog may not empty its bladder or bowls until it is six weeks old. Call a local wildlife rehabilitator or your local game and fish department. They will have more appropriate resources to care for the baby groundhog and release it to wild when it can care for itself. If the groundhog starts sneezing while drinking formula immediately stop feeding, hold the groundhog upside down and rub its back until it stops sneezing out the milk. Aspirating formula can lead to pneumonia or sudden death. If you do not stimulate the groundhog’s bladder, the bladder can rupture and the woodchuck will die.